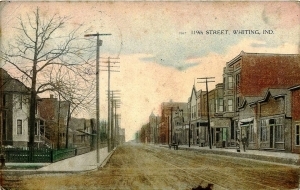 The name “Whiting” predates the city of Whiting. In 1869, “Pop” Whiting, a fearless (some have preferred to call him reckless) engineer ditched his heavy freight train, so a fast passenger train behind him could have the right of way. The area where this occurred began to be referred to as Whiting’s Siding. The construction of the railroads eventually brought settlers to the area. In 1850, when the federal government ceded the area to the State of Indiana, it was classified as swamp land and was notable for little more than its great sand ridges parallel to Lake Michigan. In 1851, the Michigan Southern Railroad, the first of three rail lines was built across the wilderness. German settlers, lured by high wages of $1 a day, followed to build and maintain the railroad tracks. At the end of the Civil War, Henry Schrage opened the first store, a business that became the commercial, political, and social center of the community. When Schrage became postmaster of the new post office in 1871, the name of the community was shortened from Pop Whiting’s Siding to Whiting. In 1880, the Census Bureau counted 115 people in this upstart community. The Standard Oil Company began quietly buying up land along the lakefront in March and April of 1889. The company was in need of a Midwestern industrial site convenient to rail and water transportation to refine crude oil, and Whiting fit those requirements perfectly. With the construction of the refinery, the community’s history changed forever. Efforts to incorporate began almost as soon as Standard Oil came to the area, but were initially unsuccessful. 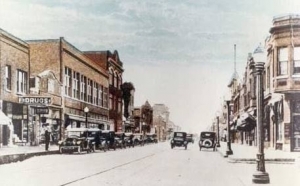 Whiting finally incorporated as a town in 1895 and as a city in 1903. With incorporation came new services, and some of the amenities of city life, including a public library and a lakefront park. In 1923, the Standard Oil Company provided land and funding for the Memorial Community Center, which became the hub of city life with its social and athletic facilities. By this time the refinery employed over 4,000 workers, and the city numbered approximately 10,000. Pop Whiting’s Siding has certainly come a long way.